Inductive and deductive grammar teaching: what is it, and does it work? Jon Hird, materials writer and teacher trainer, discusses inductive and deductive grammar teaching, comparing and contrasting the two, and debating the pros and cons of their use in the classroom. There are two main ways that we tend to teach grammar: deductively and inductively. Both deductive and inductive teaching have their pros and cons and which approach we use when can depend on a number of factors, such as the nature of the language being taught and the preferences of the teacher and learners. It is, however, perhaps generally accepted that a combination of both approaches is best suited for the EFL classroom. Some agreement exists that the most effective grammar teaching includes some deductive and inductive characteristics. – Haight, Heron, & Cole 2007. So what is deductive and inductive grammar teaching? In this blog, we will first take a look at the underlying principles of inductive and deductive reasoning and then look at how this applies to grammar teaching and learning. We will then briefly consider some of the pros and cons. Deductive reasoning is essentially a top-down approach which moves from the more general to the more specific. In other words, we start with a general notion or theory, which we then narrow down to specific hypotheses, which are then tested. Inductive reasoning is more of a bottom-up approach, moving from the more specific to the more general, in which we make specific observations, detect patterns, formulate hypotheses and draw conclusions. These two approaches have been applied to grammar teaching and learning. A deductive approach involves the learners being given a general rule, which is then applied to specific language examples and honed through practice exercises. An inductive approach involves the learners detecting, or noticing, patterns and working out a ‘rule’ for themselves before they practise the language. A deductive approach (rule-driven) starts with the presentation of a rule and is followed by examples in which the rule is applied. An inductive approach (rule-discovery) starts with some examples from which a rule is inferred. Both approaches are commonplace in published materials. Some course books may adhere to one approach or the other as series style, whereas some may be more flexible and employ both approaches according to what the language being taught lends itself to. Most inductive learning presented in course books is guided or scaffolded. In other words, exercises and questions guide the learner to work out the grammar rule. The following course book extracts illustrate the two different approaches. The subsequent practice exercises are similar in both course books. Thornbury, S. (1999). How to Teach Grammar. Pearson. Categories: Grammar & Vocabulary | Tags: Grammar, inductive grammar deductive grammar, Jon Hird | Permalink. Jon Hird, materials writer and teacher trainer, discusses the place and function of short activities in the English classroom. Jon will be hosting a practical webinar session on this topic on 12th September. While not a requirement for every lesson, quick, simple and largely preparation- and materials-free activities such as warmers, fillers and lead-in activities can add a bit of dynamism and fun into any class. But why do them? Warmers can wake the students (and the teacher) up and at the same time energise and stimulate. They help to focus minds and get the students in ‘English mode’. A good warmer can get the students engaged with English without them realising they are ‘doing’ English. Fillers can serve a similar purpose to warmers. They can be used to change the pace, energy levels and dynamics between activities or whenever needed during the class. They can both help the students to relax and give a boost when things are perhaps flagging a little. They can allow a bit of ‘time out’ between more conventional classroom activities. They are flexible and can be used at almost any time. They are also especially useful for filling time at the end of a class. Lead-in activities, as well as performing a similar function to warmers, are at the same time designed to introduce a topic, generate interest and whet the appetite. They focus minds on the topic and activate schema. Lead-ins can also be used to check, input and pre-teach any language necessary for the ensuing activity or activities. There are also a great many preparation- and materials-free consolidation activities that can be used to give further practice and help fix new language in a fun and engaging way once the coursebook and other published materials have been completed. In my upcoming webinar, Warmers, fillers and other quick activities we will look at a range of such warmers, fillers, lead-ins and consolidation activities, as well as activities to help you and your students get the most out of the course book. The webinar will use content from Headway Fourth edition. Categories: Adults / Young Adults, Professional Development | Tags: Classroom activities, Classroom dynamics, Classroom management, Fillers, Headway, Headway Fourth edition, Jon Hird, Lead-in activities, No-plan activities, Warmers, Webinar | Permalink. In this article, Jon Hird, author of the brand new Oxford Learner’s Pocket Verbs and Tenses, takes a look at the verbing of English and shares with us some interesting examples he has recently come across. A recent OUP ELT blog about the language legacy of the Olympics included some examples of nouns being used as verbs. Competitors no longer stood on the podium and won a medal, but podiumed and medalled. Athletes also finalled (reached a final) and PB-ed (achieved a PB, or Personal Best). Even Lord Coe, Chairman of the Organising Committee, got in on the act when, prior to the games, he told the nation that ‘The London Olympics need[ed] to legacy’. Verbing exists essentially to make what we say shorter and snappier. It can also give a more dynamic sense to ideas. Conversion is easy and therefore common in English because, unlike in many other languages, the base form of the verb does not take a separate ending. Verbs converted from nouns are all regular and the past forms have an -ed ending. Today, noun to verb conversion is particularly common in the field of technology, especially when it comes to the internet and digital communication. Many words which were originally nouns have very quickly become established as verbs. We bookmark websites. We email, text, message and DM (Direct Message) people. We friend and unfriend (or defriend) people on Facebook. We tweet about topics that are trending. We blog. 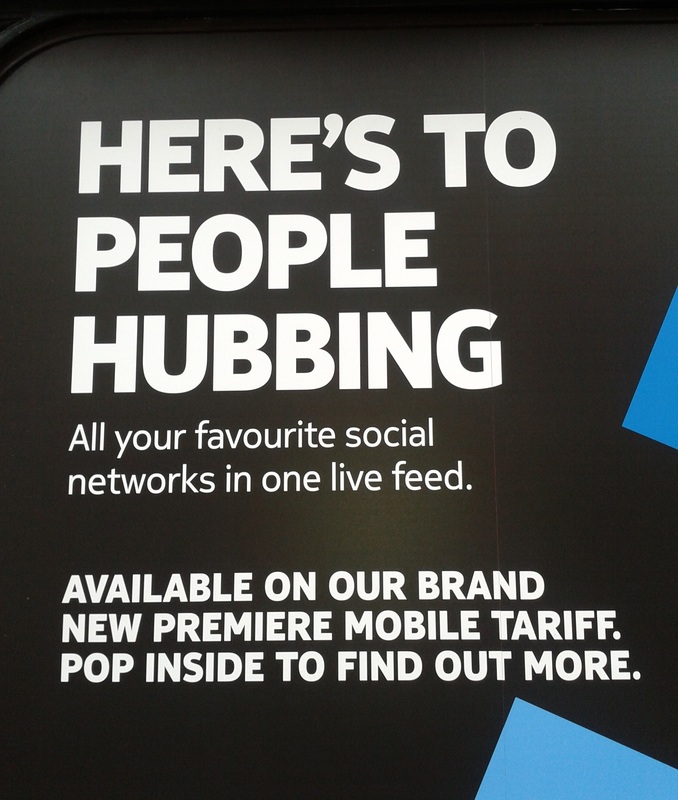 And now, at least according to one mobile phone provider, we also hub (see right). Proper nouns are also used as verbs. If we don’t know something, we google it. We skype to keep in touch. We youtube to watch video clips. And we facebook and whatsapp people about what’s going on. A Turkish colleague of mine recently found himself saying that he’d ebayed something and was wondering if it’s OK to say that. Outside the world of technology, it seems that nouns are being verbed wherever you turn. At the airport on a recent work trip, we were informed that ‘Passengers who are transiting need to follow the transit signs.’ After my return to the UK, a colleague emailed ‘I hope you had a great time conferencing around Italy.’ Around the same time a friend facebooked ‘let’s coffee soon!’ I’ve since discovered that ‘Let’s Coffee’ is the name of numerous coffee shops around the world. There’s also ‘Let’s Burger’, ‘Let’s Seafood’ and no doubt many more. Food and drink, in fact, seems to be ripe when it comes to verbing the noun. Ted, a character in the TV show ‘How I Met Your Mother’, when offering to buy someone a drink, asks ‘Can I beer you?’ After a talk I recently gave, one of the participants facebooked me this photo he had taken of a London café window (see below). Whether he saladed or sandwiched that day, I’m not sure. 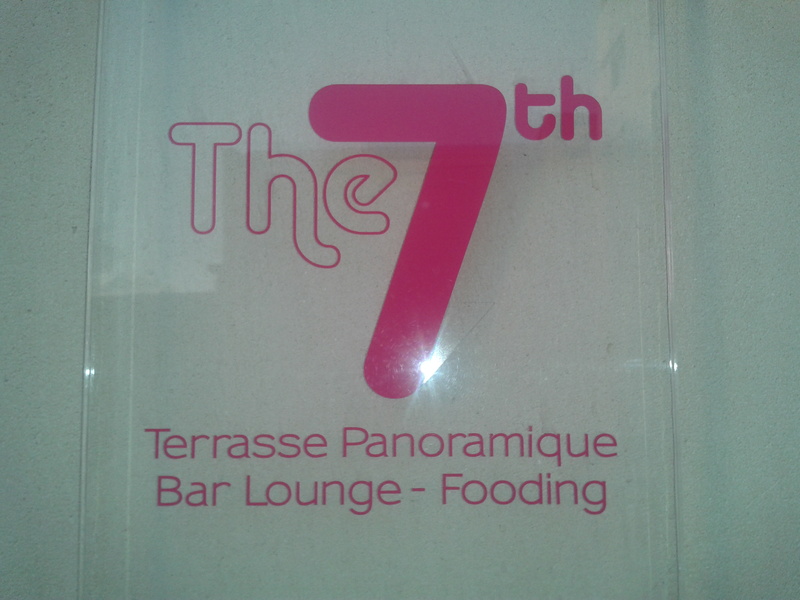 And while a considerable number of English words connected with food come from French, I was surprised to come across the concept of fooding in, of all places, Montmartre in Paris. 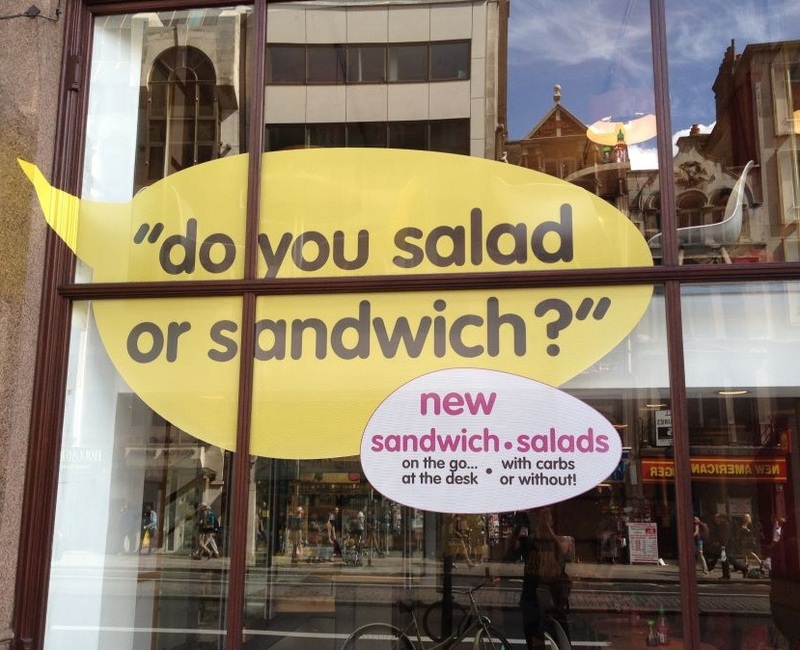 Advertisers have latched on to verbing as well. For some time now, a high street chain here in the UK has been imploring us not to shop for it, but to Argos it. 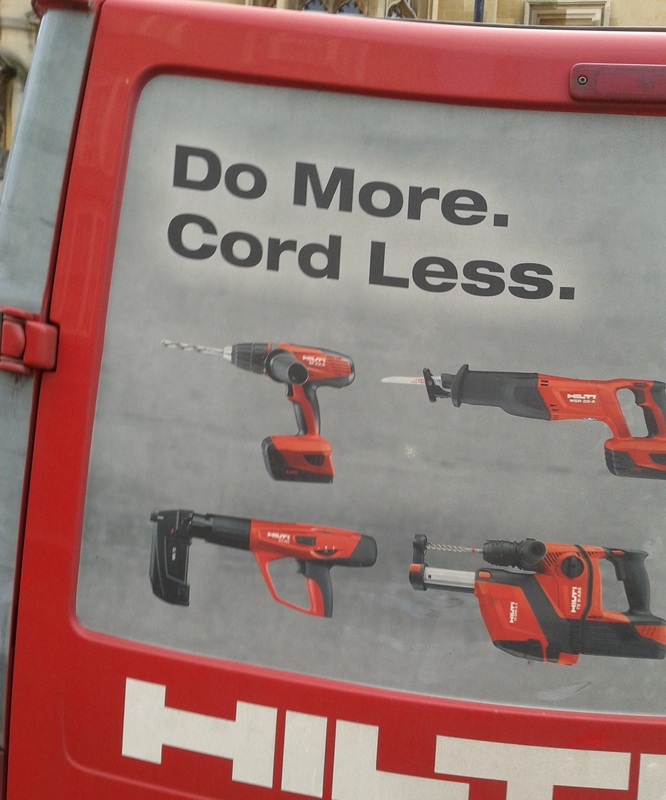 And while cycling through the centre of Oxford the other day, I noticed on the back door of a van this rather clever play on words promoting cordless power tools (see right). And only last night, during a BBC news item about the possible impending demise of the high street music store, a guest explained that part of the problem was that customers were overchoiced. So, the choice is yours – do you noun or do you verb? Keep your eyes and ears open and see how many examples of verbing you come across. A lot, I suspect. And please share some of your favourites below. Categories: Applied Linguistics, Grammar & Vocabulary | Tags: Contemporary English, Conversion, English Language, Grammar, Jon Hird, Language, New words, Nouns used as verbs, Oxford Learner’s Pocket Verbs and Tenses, Verbing | Permalink.